While Colorova, at first glance, looks like a design shop, Le Vin en Bouche, when I first walked by, looked as though someone had left the door open to the back pantry. I say that fondly because this quirky little wine shop and tasting room has an inviting spirit that comes from the knowledge and personalities of its two dissimilar owners, Vincent Martin, 41, and Jonathan Jean, 24, either of which would make a fine drinking companion. Vincent Martin is a Ferrandi graduate, where he studied the culinary arts from 1993 to 1995 after three years in hotel school and where he discovered an aptitude for and an interest in the subtleties of wine. He was head sommelier at La Truffière, where he worked from 2000 to 2010 and helped develop the gastronomic restaurant’s tremendous wine cellar. He and Jean met when the latter, then in his teens, was hired as his apprentice. Combining Martin’s great experience and Jean’s knowledgeable and engaging enthusiasm, they opened their little shop as peers in 2012. Whether you come upon one or the other you’ll get expert advice on an eclectic selection of wines and spirits and can pursue the conversation with them or with your travel companions over a glass and some well-selectedcharcuterie or fromage at the narrow table by the brick wall. They also offer wine tasting workshops and events, and Martin continues to advise restaurants and individuals on constituting wine lists and wine cellars. 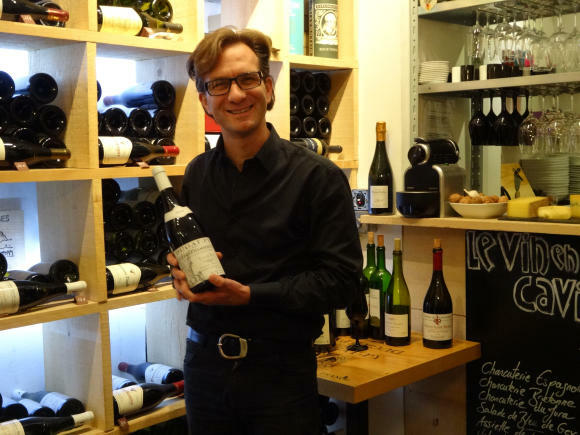 Martin and Jean’s small selection echoes their “passion for the wines of small winegrowers that truly represent their place of origin [terroir],” as Martin says. That’s a formula, at once trendy and old-fashion, that the traveler is well-advised to take as his own motto while getting to know French wines. In wine tastings with those unaccustomed to French and European appellations, Martin joins many small-shop owners in saying that one of his tasks with New World consumers it to get them to loosen their focus on expecting a particular taste from a particular grape varietal. These aren’t necessarily pricey wines. Most are in the 15-35€ range, along with a splash of more expensive wines from notable low-yield vineyards. There’s no Bordeaux in the shop, as Martin explains, because he finds that too many vintners and traders of the Bordeaux region have generally opted to sell through large distribution channels, meaning that any retail price that he might have for such wines would far exceed their price in chain shops, which would in term make him and Jean look like a price gougers. Actually, Martin does have some well-aging Bordeaux along with along with other “vins de garde” and old vintages in a private cellar in the 5th arrondissement. Those wines are also available for sale, so knowledgeable wine-lovers might wish to inquire about wines beyond those found in this wonderful little wine pantry.